The new Amazon Fire HD 10 comes in an aluminium chassis. It features a 10.1-inch IPS display. The tablet will be available in new Silver Aluminium colour. Amazon has launched a new aluminium version of its Fire HD 10 tablet. The new tablet is now available via Amazon and comes in a 64GB inbuilt storage model. The 16GB Amazon Fire HD 10 is now available at $229 (roughly Rs. 15,500); 32GB model available at $259 (roughly Rs. 17,500), and the 64GB model at $289 (roughly Rs. 19,500). The tablet comes in Black, White, and Silver Aluminium, which is the new addition. The Amazon listing notes that the Silver Aluminium version is only available with the 64GB storage model. Apart from the aluminium build and a new 64GB storage model, the innards of the new Amazon Fire HD 10 tablet are the same as the old one. For specifications, the Amazon Fire HD 10 features 10.1-inch IPS display with 1280×800 pixels resolution and offers a pixel density of 149ppi. The tablet is powered by a 1.5GHz quad-core MediaTek processor and comes with 1GB of RAM. It supports expandable storage via microSD card (up to 128GB). 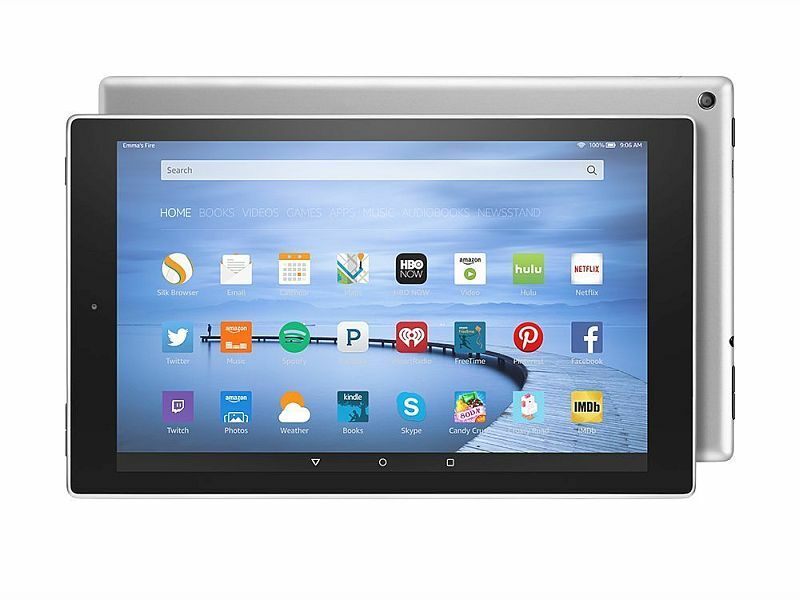 The Amazon listing says that the tablet can offer up to 8 hours of mixed usage which can include reading, browsing, watching video, and listening to music. It can fully charge in under 5 hours, according to the company. The tablet sports a 5-megapixel rear camera and a 720p (unspecified) front-facing HD camera. It supports Wi-Fi and comes with 3.5 mm audio stereo jack, and integrated stereo speaker with Dolby audio. The Amazon Fire HD 10 runs Fire OS 5 which comes with features such as VoiceView, a new screen reader; new user preferences including ability to adjust spoken punctuation level and key echo; quick gestures to adjust and navigate content by granularity; optimised web browsing; updated earcon sounds, and expanded Large Font mode. The tablet’s VoiceView is powered by the company’s Ivona text-to-speech screen reader and it provides spoken feedback to describe the actions that take place on the screen. It measures 262x159x7.7mm and weighs 432 grams.